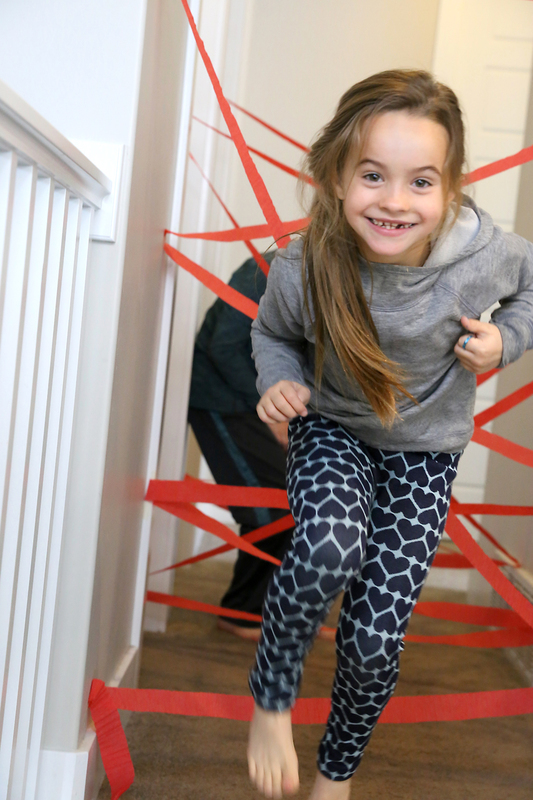 In today’s post: Learn how to turn your hallway into a laser maze for some easy, inexpensive indoor fun for kids! Christmas is over and we are headed into the doldrums of winter, which means it’s time to come up with some activities kids can do inside on cold or rainy days. We do lots of kid crafts at our house, but sometimes my kids need an activity that’s a little more active to help them burn off some energy and keep them from poking each other all. the. time. 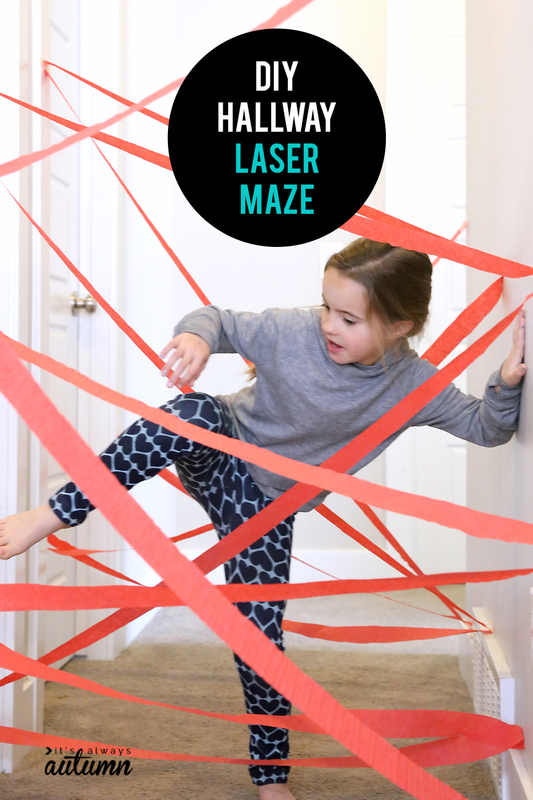 That’s where this DIY hallway laser maze comes in: kids get to pretend they are like the spies they see on movies, creeping through the lasers without touching any of them. 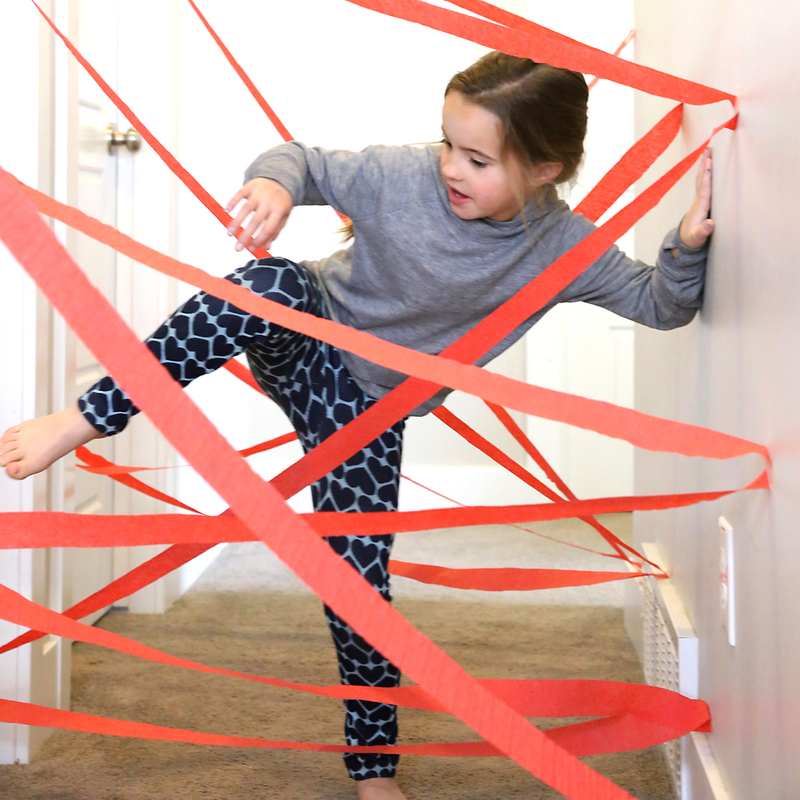 A hallway laser maze is easy to set up and will keep kids busy as they jump, crawl, and climb they way back and forth. It’s a perfect activity for a rainy day. Years ago I saw this idea on Brassy Apple and I’ve always wanted to give it a try, so last week we did. You will need crepe paper (also called streamers), which is basically a long string of paper that comes on a roll – it’s usually used to decorate for parties. You can usually find it in the party section of a store – I found mine at the dollar store in packs of two rolls for a dollar. You’ll also want masking tape so you can tape up the maze without damaging your walls. Basically, you’re just going to tape the crepe paper on the wall in a zig zag pattern, back and forth, high and low, moving down the hallway. The idea is to create a “maze” that your kids can then work their way through, like the laser mazes you often see on spy movies. For reference, the maze you see below was created with one roll of crepe paper. Try to make the maze hard enough that kids can’t just crawl under the entire thing, but easy enough that your child won’t be frustrated and give up. Encourage your kids to treat it like a real laser maze: i.e. tell them to try not to touch any of the crepe paper to get through it safely. Kids can take turns working their way through the maze and could even time each other to see who gets through the fastest without touching any of the lines. Once they’re done going through to maze, kids can toss a ball back and forth through the maze, trying not to let the ball touch any of the lines. For more fun, let older kids create the maze themselves. 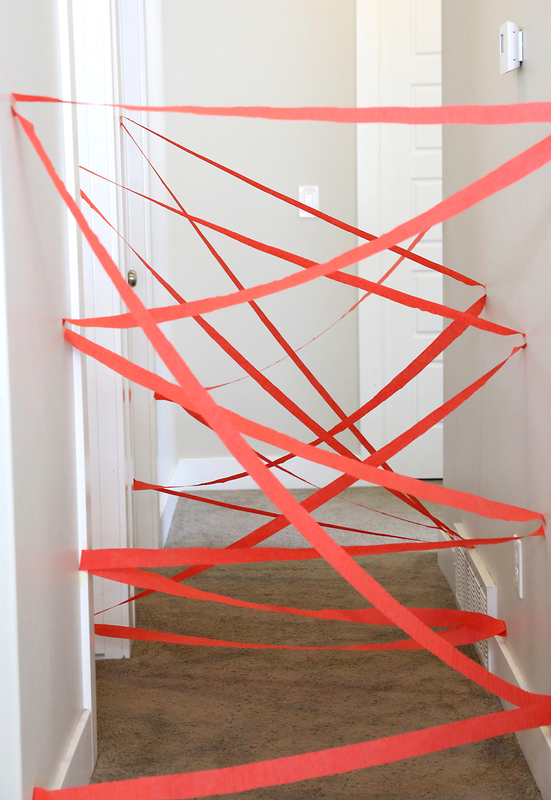 A hallway laser maze can also be a fun activity at birthday parties! I think i would put gloves or socks on their hands. I see a lot of wall touching going on. Great idea for a cold, yucky day!